This exciting and magical musical adaptation of C.S.Lewisâ€™s classic story is the tale of four children evacuated from London during the Blitz to stay with the Professor. 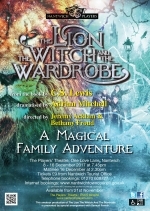 Whilst exploring, Lucy stumbles across the wardrobe, a gateway to another world, Narnia! An icy totalitarian kingdom, under the spell of the White Witch. â€œWhere it is always winter and never Christmasâ€. So the adventure begins and very quickly Peter, Susan, Edmund and Lucy find themselves caught up in a deadly struggle between good and evil. Some adventures lead us to our destiny. Commissioned by the Royal Shakespeare Company, this adaptation was first performed at the Royal Shakespeare Theatre, Stratford-upon-Avon, and later transferred to the Barbican Theatre, London. Directed by Jeremy Acklam & Bethany Froud, performances will be at 7.45pm on 8th â€“ 16th December & Matinee on 16th December at 2.30pm, 2017. Tickets priced at Â£9.00 will be on sale from Nantwich Tourist Office (01270 600727) or on-line at www.nantwichtowncouncil.gov.uk from Tuesday 21st November 2017. Priority tickets for our VIP Supporters go on sale Saturday 18th November at the Theatre. To find out more about becoming a VIP Supporter visit the membership section of the website.